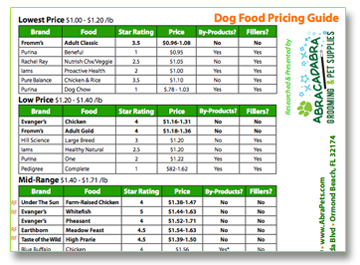 Use this guide to compare the food you’re currently purchasing with a higher quality food in the same price range. The dog foods that Abracadabra proudly sells are listed in bold. All of our foods are quality selections. Let us know if you have any questions. We love helping our customers find the best pet food for their pet and their wallet. Want to learn more? Our pet food blog discusses the best quality foods and the pet foods to avoid.